So first of all we are still in the bear market and the last few weeks have seen lots of FUD, panic and overall media negativity. There has been plenty of doom and gloom that Bitcoin (BTC) is doomed and the bottom is nowhere near etc etc. As it stands BTC dominance is high 54.9% (at time of publishing), with one BTC bouncing around the $3200USD to $3600USD mark. It appears the commentators who are still around are trying to predict the capitulation phase and some claim it is going to be how 2018 ends. So what does capitulation actually mean? Well it is originally derived from military terminology to mean to surrender. In traditional financial sense it defines when investors give up any previous gains in any security or market by selling their positions during periods of declines. This phase can happen at any time in a market, but typically happens during high volume trading and extended declines for securities. A market correction or bear market often leads investors to capitulate or panic sell, which is exactly what we have seen in the cryptoworld starting mid November. Hindsight is the only clear indication of when capitulation has occurred and the charts can be read so obviously, but none of us have true foresight or an almanac from the future of Crypto prices. So when capitulation occurs it makes the survivors assume that everyone who wants to sell a stock for any reason, including forced selling due to margin calls, has already sold and that these new low prices will stabilize. It will be interesting to see how the price of BTC ends the year, 11 months or so ago people in the know were making wild claims of USD values of 20k, 50k or even 100k! Oh those optimistic days of bull markets! Let us all endure this hibernating winter’s bear! Oh EOS, why is your CPU demand so high? Seems to be the most common topic of discussion on forums and blogs in the EOS world. A very useful tool I find that I have been checking a lot is ‘EOS Resource Planner’ a feature created by the block producer, EOSNewYork. It gives a clear display of the current cost of RAM, CPU and Network in a easily readable UI. So the fluctuation of CPU value is due to it’s elasticity of network demand. The amount of CPU time that staking 1 EOS gets you is determined by the current network conditions. CPU bandwidth is used when transactions or actions are put into play. In the same way that normal processor on a computer works. As well as the longer you run a program the more CPU is going to be required. As more transactions continue to appear on the network, the value of CPU bandwidth will increase. For a practical worked example, this means that if someone is spamming the network as hard as they can, and they have 100 EOS staked, and you have 1 EOS staked, then CPU allocation will adjust until the spammer is using CPU at the target rate, so your EOS will let you use 1% of that amount. With the ability to look up account names and to see who is playing on dice gambling dApps constantly you can see that there are some people with very high values staked, (crazycapital on betdice for example) who are constantly rolling using auto-roll, but have 3000 Staked EOS. Which is their right to have staked, but it just means that it inhibits smaller staked users from using the network as it drives up the price of CPU. 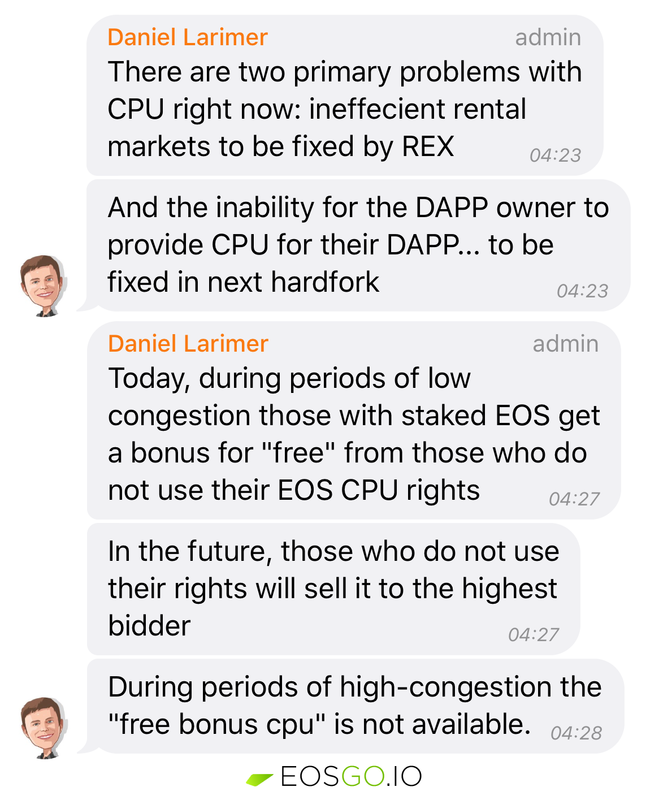 A large proportion of this and mentioned by Dan in recent telegram posts, is that dApps at present are not able to directly provide the CPU for the dApp. The burden of responsibility falls on the user to have the resources to interact with the application. This is something to be upgraded and changed in planned future versions of the EOSIO. Again he talks about the implementation of the REX exchange system as going to be a key solution but as to date there is no official planned release. It has also caused the Trybe airdrop to be delayed and I imagine will be effecting other projects on EOS that did not plan or budget for such high cost of CPU. We will all just have to hunker down and await what is promised. Dan also posted a medium article that further criticized dApps owners in terms of the burden of CPU responsibility on to the user. While the BP’s and Block One will hard-fork and implement systems to increase overall CPU capacity, more needs to be done by Dapp developers to reduce the demand of CPU there apps require. Dan’s article focus on DICE, one of the gambling tokens and criticizes its inefficiency, with a highly noticeable use a lot of copy-and-paste code for token contracts. Combined with a lot of atomic micro-payments is causing this high cost. He highlights some suggestions that would improve these contracts, such as merging independent contracts into a single contract. Then by having a merged new contract it will eliminate all the inter-contract communication between the pre-existing contract(s). Tokens can be issued without creating inline actions and he suggests allowing users to maintain a deposit balance. Eliminate the need to communicate with the eosio.token contract multiple times. User account balances can be updated quickly and efficiently the internal dApp contract without having to notify sender/receiver for every micro-payment. All of these are great comments, observations and suggestions on solutions, whether any of the Gambling dApps take note and implement these changes we will have to wait and see. CPU is probably going to remain high for a little while longer, and will cause those with small stakes to be a little bit peeved off. The markets on whole are still trying to find some stability, I think December will end with sideways actions and maybe even a little lower in trying to find a new bottom. It can be suggested that the panic sell and initial surge of people leaving the space is starting to wind down but there is no guarantee. I am still in for the long haul and I expect there to be a continuing focus on growth, innovation and development across the whole crypto sector, while prices remain at these new lows. This Article has Earned 2757 Tokens. Im a little more skilled, like the average people, in tech topik, but for me, is also difficult. Thank you, I am glad you thought it was helpful! hehe click all the hyperlinks! Glad they helped. I like your style. I’m looking forward for your next series. Thanks for another quality update @dukefish. CPU usage will have to be addressed so normal holders can freely use the network without issue – I guess time to wait and see. Since I published this entry there have been some developments across the EOS ecosystem and new plans, updates and projects announced. I hope to report on these in my next article which I am currently researching and working on. Thanks for your kind words, it is humbling to know people read and enjoy my entries! Thanks, I do tend to write a lot! Yes it is frustrating, don’t worry you are not the only one! Thank you for reading and commenting pal! Interesting infos, about the DICE code for example. Thanks for sharing! You are welcome. There was an official response which I will talk about in my next installment! Great post @dukefish – thanks for sharing, I will post this forward. pleasure and deserved my friend. Yeah there is lots occurring in this space its a task to keep up to date, thanks for reading glad it helped!